ICC U19 ODI world cup is goes to bring at this 27th January in Bangladesh, which is fixture for 48 match. 16 participants team will play in 4 divided groups. 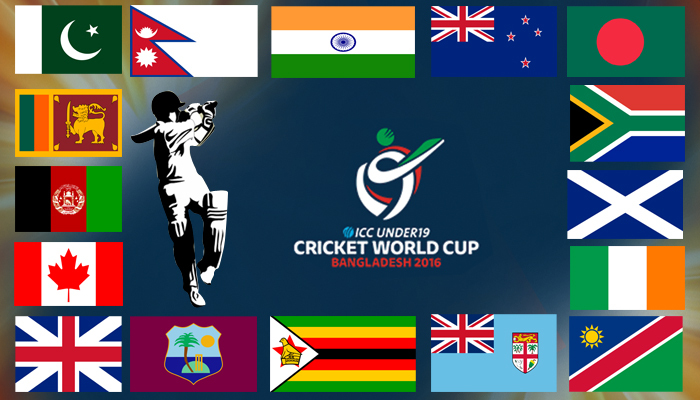 Al 16 teams are conforming there squad and player list for Upcoming world cup of U19. The 11th addition’s all player name of all 16 teams are given below. Tony de Zorzi (capt. ), Ziyaad Abrahams, Wandile Makwethu, Conner McKerr, Dean Foxcroft, Dayyaan Galiem, Willie Ludick, Rivaldo Moonsamy, Wiaan Mulder, Lutho Sipamla, Luke Philander, Farhaan Sayanvala,Liam Smith, Kyle Verreynne and Sean Whitehead. Neil Flack (capt. ), Haris Aslam, Ryan Brown, Mohammad Ghaffar, Rory Johnston, Scott Cameron, Harris Carnegie, Mohammad Azeem Dar, Ihtisham Malik, Finlay McCreath, Simon Whait, Jack Waller, Mitchell Rao, Owais Shah, Ben Wilkinson. Jack Tector (capt. ), Rory Anders, Stephen Doheny, Aaron Gillespie, Andrew Austin, Varun Chopra, Adam Dennison, Josh Little, Gary McClintock, Fiachra Tucker, Lorcan Tucker, William McClintock, Tom Stanton, Harry Tector, Ben White.